The mission of The Lisbon History Center is "To preserve and display the history of our area." Our objective is to become the focal point for memorabilia in the Lisbon/Franklin Township area. We are currently looking for collections to display in our front parlor area. Located along the historic Lincoln Highway. Please sign our guest book so we know who has been visiting our website. If you leave your email address we can put you on our mailing list to let you know of special events coming up at The Lisbon History Center. To find the guest book click on the arrow next to Home at the top of this page and then click on guest book. If you would like to make a donation to the Lisbon History Center, please click on the link below. Well for anyone who has been to the Lisbon Cemetery you know that this secret is not little nor is it a secret to cemetery goers.​ We are talking about the 4 ton granite Gettysburg Boulder that stands proudly in remembrance of those who served our nation in the Civil War. This quiet reminder of a very pivotal point in our American History stands proudly for all to see. 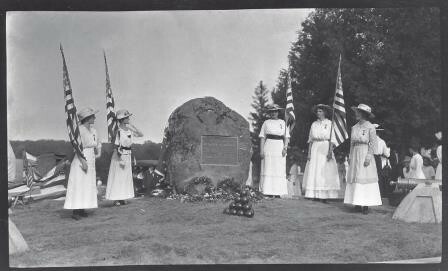 ​Over one hundred years ago some local residents and the Women's Relief Corps sent a request to have a boulder from Gettysburg for a memorial monument. The first request was in late 1914 and the process took over a year before the boulder was secured. Please read here for a brief story about how the boulder came to be part of Lisbon, this is from our 2011 Cemetery Walk. A special note is that there were only 2 boulders ever removed for the Gettysburg Battlefield. ​​We are glad to announce that the 100th year of this memorial will be coming up in May of this year. The Gettysburg Boulder has stood proudly in the same spot for a century reminding everyone of the struggles of the civil war. Along side of the boulder there are also grave markers of Lisbon residents who served in the Civil War, not necessarily in the Battle of Gettysburg. At the Lisbon History Center we have copies of the maps where the boulder came from, almost all the correspondences ​​from the acquiring of the boulder. You are free to stop in and take a look and ask questions. -The Lisbon History Center is on the search again. We are looking for unique displays for out front display cabinet. Through out the year we change around our front parlor area with various displays. We have many displays like our military, wedding dresses, antique dolls and other holiday displays. What we are looking for is anything that is unique and interesting, if you have a collections that you would like to display let us know. We would be glad to display your collection in our glass showcase for a month or two. *This year the history center might have unexpected closing due to weather. For the safety of our guests and volunteers we will be closed if we have ice, heavy snow or frigid temperatures. -We would like to welcome everyone to 2019 and hope everyone is having a good start to the year. We ask that you check back often for events the history center will be having. We don't have anything planned yet early in the year but we hope to have events starting in the Spring.